in the pre- and post-Chinese occupation years—where people live enchanted lives, with simple needs, simple beliefs and a deep faith that their Gods will never fail them. Dr. Tsewang Yishey Pemba is Tibet’s first medical practitioner as well as its first writer in English. In this, his third novel, posthumously published, he gives us a glimpse into the intimate lives of the Tibetans, their pride, their generosity, their warmth and hospitality, and most of all, their love for the achingly beautiful Nyarong Valley, the land of the Khampa warriors in the Eastern District of Tibet. For those of us who do not know the story of Tibet’s occupation by Communist China, Dr. Pemba brings the reality of those times upfront and close. In a world where people across countries are being displaced from their homes and running away to become refugees and live on the streets of unfamiliar lands, White Crane … will find a resonance in the hearts of readers who are either longing for their own homes or watching with horror the plight of displaced others around them. The Tibetans look up to their Gods and their Rinpoches to deliver them from the rising threat of invasion but ultimately the Gods fail Tibet. The Gods continue to fail them. Tibet lived its idyllic life in a world all its own. Like the primary characters repeatedly say, ‘all we want is for them to leave us alone and let us live our own life. That’s all.’ To revel in the splendour of their valley and live with no harm to anyone. But in the rolling juggernaut of life perhaps that was too much to ask. The book turns slow paced at times, the characters do not always stand out sharp and clear. But none of that takes away from the fascinating story, simply told, of a nation in turmoil. 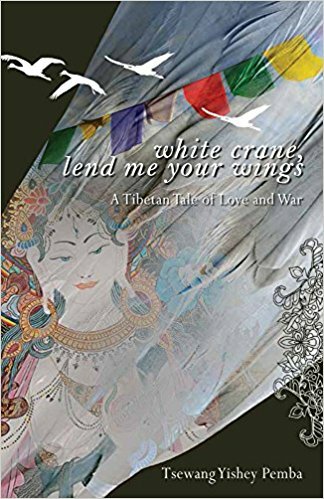 In the end White Crane is another story of heartbreak and loss; of love and longing; of a displaced people pining for home.The book underlines Dr. Pemba’s own desperate longing for his Motherland, which has been consumed into the Great Chinese Motherland. The book ends on an open note. The young American son of the missionaries, who has ventured out for help, plans to return to Nyarong. Will he? Will he and his Khampa warrior friends now engaged in guerilla warfare, throw the Chinese out of Tibet? Will the two million Tibetans displaced and forced to become refugees in their neighbouring countries, ever be able to return to their land and live life the way they want to? A small dream surely? Will it ever see the light of day? Perhaps. Malati Mukherji is a writer and translator who lives in The Nilgiris of South India.